How to import contacts into Tripolis Dialogue? 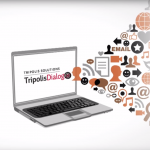 Home » Portfolios » How to import contacts into Tripolis Dialogue? Within the Contact Module of Tripolis Dialogue you are able to import contacts to your database very easily via the import functionality. In the video above we’ll show you how to quickly and easily import contacts into the Tripolis Dialogue database.